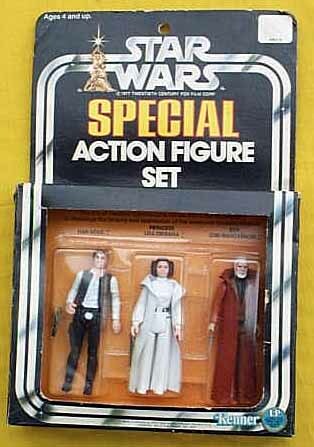 This set represents a unique variation of the "Special Action Figure Set" that was not known to exist before a complete set of these first series three packs was purchased recently from a former Kenner employee. Although all the text and graphics on these packs match the production item, and the figures seem to be on production quality blister cards (as opposed to hand-glued mock-ups), the shadow box on these packs is very different from the production version. The top border is the same width as the sides and the bottom edge, whereas it is trimmed back to the edge on the production package. Most likely this was changed to allow consumers to see the text about the characters on the blister card insert. This set actually appears to have been hand-modified after being printed, since there are cut marks in the upper corners of the shadow box. My guess is these corners were originally rounded like the lower ones, but cut square in an early attempt to make the text more readable. After discovering it was still hard to read the text, the package was modified to the version found in stores. Another difference is that the "punch" on this set is simply a round hole punched above the Star Wars logo, which is probably because this set was assembled from a pre-production box flat instead of the final item. Box flats of the production version also lack the standard punch. Although several different box flat versions and packaging samples have been found, none have represented this stage of the concept and more closely resemble the production items. It is always exciting when a production variation is discovered, and even more so when it is for a highly desirable item like these three packs. 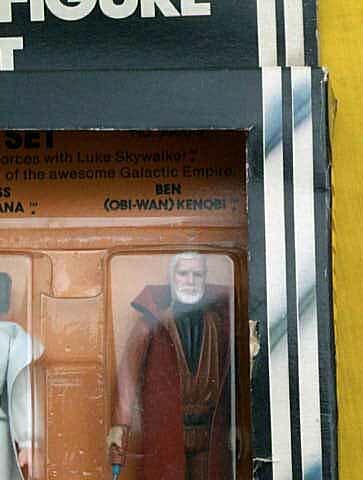 Interestingly enough, the Kenner employee who owned these purchased them from the company store. Early versions of many toys found their way to the store, and most were likely opened as toys. Fortunately, a few items like these packs survived. It will be interesting to see what other variants pop up as collectors continue to explore the holdings of former Kenner employees.